Sawyer is 11 months old. How did this happen? When did my baby turn into a little boy? I feel that this month more than any other I've really seen a change in him and he's becoming a toddler. I miss my little bundle that I used to snuggle with all day. Life has definitely changed in our house. Not better or worse, just different. Busy. Sawyer does not quit moving when he is awake. He is exploring pretty much everything he can get his sticky little hands on (or put in his mouth). I haven't weighed him (will get an official weight next month at his 1 year visit) but I would guess he's around 24 pounds and has definitely grown taller. We are moving into 12-18 month clothes more for length than anything else. I haven't been putting shoes on him much but he is already into size 4 shoes! I've gotten some really cute stuff for him for fall that I'm excited for it to get cooler for him to wear. He's still in size 4 diapers both day and night. Sawyer is a quite proficient crawler now and pulls up to stand on pretty much everything. He can stand independently for a few seconds and cruises around the coffee table while holding on or using his walker toy. I'm guessing he will be walking right around his first birthday. His lightning speed crawling led to his first tumble down the stairs. So, we got different baby gates to confine him to the living room. He for the most part likes being "behind bars". 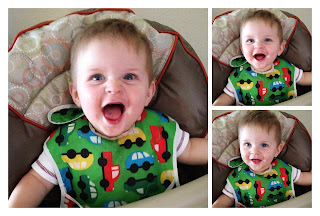 He's added a few more sounds to his vocal repitoire including da da da, ba ba, ya ya, and blowing raspberries. He continues to love to laugh at mommy and daddy or at himself in the mirror. He loves to watch you clap but hasn't clapped on his own yet. He also is close to waving but won't do it on cue. He's also into pointing at things. Still only have the two bottom teeth but I keep thinking that more are going to pop through any day now. Sawyer is a champion eater. He will eat pretty much anything you put in front of him. His most recent obsession is blueberries. This kid has downed his body weight in blueberries in the last few days. He also loves Cheerios, string cheese, chicken and banana. He's not much into purees but will eat yogurt. He loves to drink water from his sippy cup. He still gets breast milk several times a day but breast feeding is a bit more of a challenge as he doesn't want to sit still that long. Not gonna lie, Mommy is ready to close up the milk bar. I wish I could say we are doing better but since he learned to crawl, sleep has been difficult. We had periods of him being up for 2 hours in the middle of the night to periods of him waking up every 2 hours needing to be picked up and comforted back to sleep. The last few nights have been better - minimal wakeups but up early in the morning. Someday this child will learn to sleep all night until at least 6:30. I hope. I pray. Sawyer loves his Baby Einstein piano - we put the legs on it so he can stand and play it and will often push it around the living room. He still loves his maracas, extension cords and the TV remotes. His new favorite game is the "I'm gonna get you" game where we chase him around the room. He's all boy in that he loves to climb - over your legs, over the dog, up on to the table if you will let him. He gives mommy and daddy lots of kisses and likes to flip pages in books. All in all, he continues to be a happy guy. He's cranky if he's teething or hungry or not feeling well. Otherwise he's pretty happy exploring the living room, feeding Charlie half his lunch, and shaking anything that makes noise. I love this little guy so much (even when he doesn't sleep well) and can't believe that he's almost a year old! Here are a few more pictures from this month. aw, he's so cute! Our little guy just turned 5! it goes so fast!